Product is tray loading external portable ODD caddy which is suitable to USB 2.0/3.0 connector desktop or laptop. Compatible Windows XP/2003/Wind8/Vista/7,Linux, Mac10 OS systerm. No extra drive, support plug and play. Compatible USB3.0 port and the following ports USB2.0/1.1 efficiency more stable. Applies more widely. Data cable with pure copper braid process, anti-interference ability, signal attenua-tion, more stable data transmission. The applicable standard SATA ODD. Prior to using the Disc drive, please make sure your computer contains Media player software. Customer's using Windows 10 are advised to Install VLC Media player to Play DVD and CD. This product is a data line interface properly connected to USB port of the computer, the computer display lower right corner should appear device icon. Click on the desktop, open the "my computer", in" the mobile storage device should display the drive icon". Click on this icon button, select the "pop" in the tray into the oppropriate disk read. 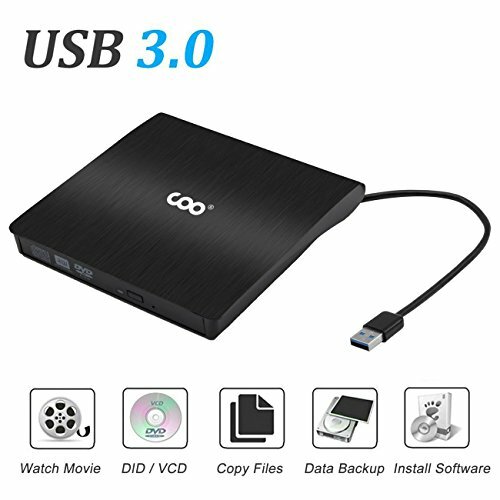 【Advanced USB 3.0 Technology】COO External DVD CD drive is equipped with USB 3.0 high speed interface which provides faster data transmission speed (up to a maximum of 5Gbps/ 640MB/s). 【No Driver & External Power Needed】Pulg and Play. Just plug external DVD drive into laptop USB 3.0 interface and the DVD driver will be detected. With this External CD Drive you can record CD, music, videos, installing software or create CD/DVD backup disc. 【High Performance】This DVD/CD Rom Rewriter Burner supported DVD+R, DVD-R, CD-ROM, DVD-ROM, CD-R, CD-RW. Max DVD read speed 8X; Max CD read speed 24X and max CD burn speed 8X. The usb DVD drive is compatible with USB2.0 and backwards compatible with USB1.0, efficiency more stable, applies more widely. 【Embedded Design】Easy for USB Cable storage. The CD/DVD drive and the USB cable are combined in one embedded design means the CD-RW Rewriter Burner can be slipped in your travel bag, and hooked up at any time. Fashion and practical. 【Support Compatible Systems】This CD/DVD drive writer/burner is ideal for various devices. Windows XP/ 2003 / Vita/ 7/ 8.1/10, Linux, Mac 10 OS system Support Laptop, Desktop Computer, please connect the device to the USB port of the motherboard for normal use. If you have any questions about this product by COO, contact us by completing and submitting the form below. If you are looking for a specif part number, please include it with your message.